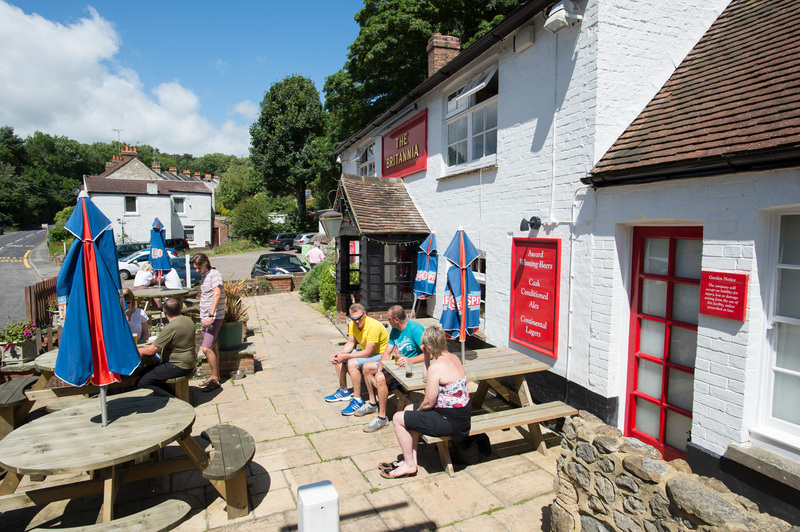 For cask ales and camaraderie by the coast, head for The Britannia - a traditional Kentish pub in Seabrook, near Hythe. With its whitewashed brickwork and traditional picket fence, The Britannia is every inch the coastal country pub. Situated in Seabrook, just outside Hythe, with the splendour of the sea-front just a 20-minute stroll away. It’s the perfect setting then for a relaxing pint or a hearty pub lunch before heading off to enjoy the boutique shops, beautiful beaches and intriguing architecture of Hythe itself. Not that you have to leave the pub to find great entertainment. There's always something going on at The Britannia - from our weekly Wednesday quiz to regular live music, cocktail nights, charity fun days and more (Like us on Facebook for all the news on our upcoming events). Indeed, The Britannia is a pub right at the heart of local life, and it’s been that way for more than a century. In the days of the British Empire, soldiers billeted at Shorncliffe barracks would come here to savour the ales and the atmosphere - carving their initials on a particular table to mark their visit. That tradition may have passed, but the convivial atmosphere remains - with a warm welcome and friendly service awaiting every visitor.